Takuko White Soy Sauce is rare with a long tradition in Japan. Light amber in color as well as cleaner and thinner than typical soy sauces, this white soy infuses wonderful flavor without darkening the color of foods. 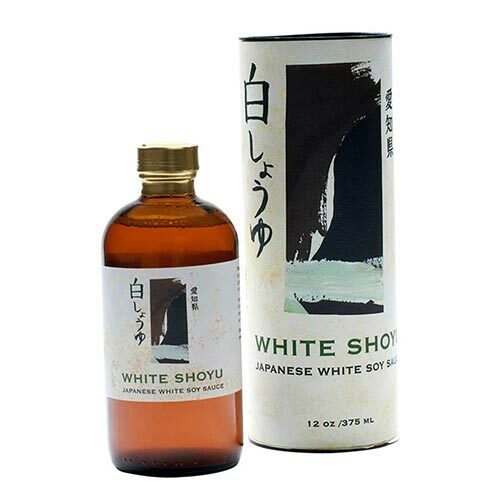 The more subtle Shiro (or white) soy sauce involves a greater quantity of wheat and has a lighter color and sweeter flavor than traditional soy. The wheat is roasted in hot sand until it turns fox brown in color and yields a fragrant aroma. Then it is coarsely milled to resemble cracked wheat and a very small amount of steamed soy-beans are mixed with the fragrant, roasted wheat. The soybeans and wheat are mixed together and inoculated with koji seed. Because of this mildness, white soy sauce is a favorite of chefs looking to add the flavor of soy without overpowering the flavors and colors of other ingredients. Ingredients: water, wheat, sea salt, fermented alcohol, soybeans.